Thanks to various efforts to fight pollution, the water in West Lake is cleaner than it has been in 50 years. 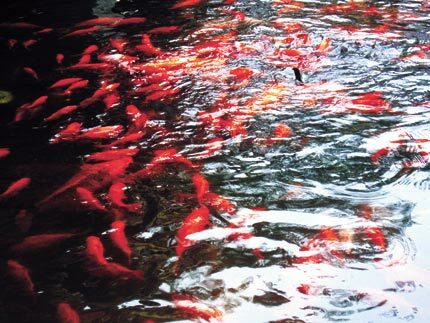 Hua Gang Guan Yu (Viewing Fish on the Harbor of Flowers) is in the southwest of the West Lake. The West Lake Water Conservation Project has dramatically improved water quality and helped restore the ecosystem. It has torn down nearby structures, stopped discharge, built treatment facilities and introduced new aquatic plants. 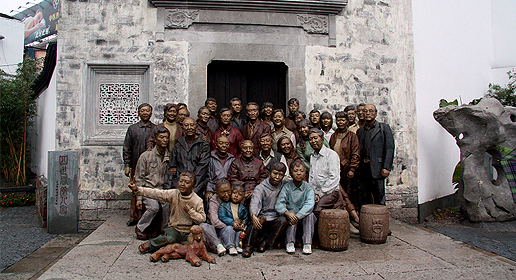 Xu Wenwen reports. The water in West Lake is cleaner than it has been in 50 years, due to nearly 10 years of fighting pollution. 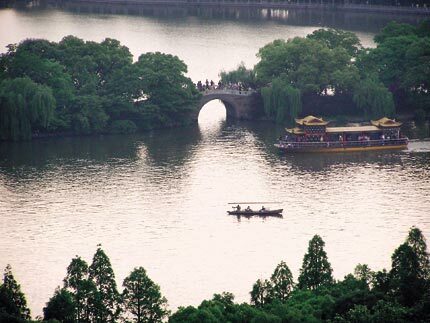 The lake's average water transparency reached 81.7 centimeters last year, and the transparence west of Su Causeway (Su Di) is more than one meter, according to Hangzhou's West Lake Water Area Administration. The figures represent the cleanest level in 50 years, officials say. The transparency is about 30cm better/further than in 2003 and 16.7cm deeper than that in 2006, they say. City workers used a Secchi disc, a standard international device and practice, to measure clarity. Readings are taken when the patterns on the disc are no longer visible to the naked eye. Walking around the lake, visitors can see the shallow water appears clear green. "If you collect West Lake water in a mineral water bottle, it looks just like a bottle of mineral water," Hangzhou Vice Mayor Zhang Jianting said last November at the Mayors' Forum of the 13th World Lake Conference in Wuhan, Hubei Province. The lake is cleaner because there are less organic nutrients such as nitrogen and phosphorous that promote growth of algae, less fish excreta, less polluted soil from nearby areas and less water discharged into the lake. Development around the lake and more human activities (residential and commercial) means more polluted water finds its way into the lake. Growth of natural aquatic plants, floating and submerged, helps filter the water. Too much organic material can choke off growth by preventing sunlight from penetrating. City workers harvest overgrowth and supply new aquatic plants. Back in 2003, transparency was only around 50cm and aquatic plants could not live longer than a week because organic pollution produced so much sun-blocking algae. In 2007 workers removed around 20 tons of plants, in 2008 they removed 100 tons and last year they removed 200 tons to keep the waterway clear for transport. There's so much growth that it can no longer be harvested by hand - harvesting machines are required. Not only are surface plants flourishing but so are submerged plants that get rid of the excessive organic pollutants. "Submerged plants have a big appetite for nitrogen and phosphorus in the growing process," says Wu Zhiying, vice director of the West Lake Water Area Administration. "One key to preserve West Lake water is to keep water plants alive and growing." Introducing and harvesting aquatics is part of the West Lake Comprehensive Protection Project initiated by the city in 2001. In addition, the Hangzhou government has built two treatment facilities for water that is drawn from the lake and returned to it. Over nine years the city has reclaimed 0.9 square kilometers of water area, enlarging the lake to 6.5 square kilometers. A dredging project has increased average depth from 1.65 meters to 2.5 meters. To stop sewage pollution, the government relocated more than 7,021 people and 2,790 households; it tore down squatters' buildings and structures without historic conservation value, clearing around 594,000 square meters of land. To reduce chemical pollution, all the craft on the lake, more than 500, are powered manually or by electricity. "The lake is a living thing. If her food chain is integrated and the ecosystem develops in a healthy way, she can live like a healthy person with perfect circulation and perfect metabolism," says Wu. "This kind of water area is a virtuous cycle, natural and stable."